First of two (?) record by this punk/powerpop/post-punk outfit. I haven't found informations about the band. A superb record ! 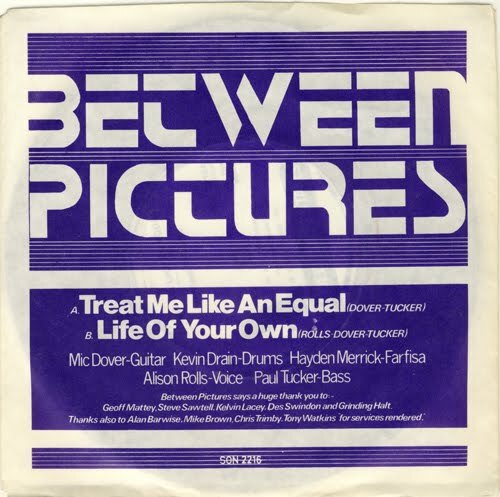 Between Pictures were from Reading, they released 2 singles, this one and "Birthday Card" / "Down At The Factory" (1981, Applause Records, Clap 3). Vocalist Alison Rolls and guitarist Mic Dover subsequently ended up forming another band called Friction Groove with bassist Ali McMordie ex Stiff Little Fingers. Friction Groove were signed to Atlantic and tipped for great things. Their first single "Time Bomb" was a minor hit but unfortunately when the album, Black Box was released it suffered major distribution problems because of [a postal strike iIrc] so the impetus was lost and the band's career sadly never recovered. 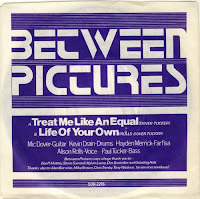 On the sleeve for "Treat Me Like An Equal" / "Life Of Your Own", you'll find a "Thanks" sectin which mentions Grinding Halt - that was the fanzine I used to co-produce, we were huge fans of Between Pictures and I even used to do some roadie-ing for them occasionally at gigs outside Reading.